Performance-based Hiring: Recruiters and HR professionals who attend all four modules of Performance-based Hiring for Recruiters (formerly Recruiter Boot Camp) Online, and successfully complete the required homework, receive certification in Performance-based Hiring. Those who achieve certification receive a personalized certificate (suitable for framing), and may use the Performance-based Hiring Certified logo on their website, resume, or other marketing collateral. HRCI: The Adler Group is a HRCI pre-approved training provider. All half-day and full-day Performance-based Hiring Training for Recruiters or Managers classes are approved for HRCI recertification credits. Attendees of Performance-based Hiring for Recruiters or Managers Online & On-site are eligible to receive up to 16 credit hours toward PHR, SPHR or GPHR recertification. Attendees of full-day workshops are eligible for 8 credit hours. Attendees of full-day recruiter workshops who achieve their Performance-based Hiring Certification are eligible for 16 credit hours (8 hours of class instruction, plus approximately 8 hours of homework). Attendees of ½ day training workshops are eligible for 4.5 credit hours. Attendees of the full-day onsite Lou Adler’s Master Course for Recruiting Passive Candidates Using LinkedIn are eligible to receive 8 credit hours toward PHR, SPHR or GPHR recertification. 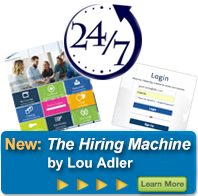 Attendees of our two-hour online Lou Adler’s Master Course for Recruiting Passive Candidates Using LinkedIn are eligible to receive 2 credit hours toward PHR, SPHR or GPHR recertification. SHRM: The Adler Group is a SHRM Preferred Provider. All half-day and full-day Performance-based Hiring Training for Recruiters or Managers classes are approved for SHRM Professional Development Credits (PDCs). Attendees of Performance-based Hiring for Recruiters or Managers Online & On-site are eligible to receive up to 16 PDCs toward SHRM-CPSM or SHRM-SCPSM recertification. Attendees of full-day workshops are eligible for 8 PDCs. Attendees of full-day recruiter workshops who achieve their Performance-based Hiring Certification are eligible for 16 PDCs (8 hours of class instruction, plus approximately 8 hours of homework). Attendees of ½ day training workshops are eligible for 4.5 PDCs. The Adler Group is recognized by SHRM to offer Professional Development Credits (PDCs)for the SHRM-CPSM or SHRM-SCPSM. This program is valid for up to 16 PDCs for the SHRM-CP or SHRM-SCP. For more information about certification or recertification,please visit www.shrmcertification.org. NAPS: Attendees of Performance-based Hiring for Recruiters (formerly Recruiter Boot Camp) Live or Online are eligible to receive up to 1.6 credit hours toward NAPS re-certification. Attendees of ½ day public workshops are eligible to receive .45 credit hours. Attendees of full-day workshops are eligible to receive .8 credit hours. NAPS awards re-certification credits according to the following formula: 10 hours of continuing education activity = 1.0 CEU. HR Professionals are required to obtain 5 CEUs in every three-year period to maintain their NAPS certification status. HRPA: Attendees of Performance-based Hiring for Recruiters (formerly Recruiter Boot Camp) Online are eligible to receive 10 HRPA Re-certification Points toward HRPA re-certification.